This fall, Philadelphia Public School students have a new kind of assignment—learning about alternatives to eating meat. Schoolchildren throughout the city will partake in the once-a-week meatless “Lean and Green Days,” part of an effort to create a healthier, more environmentally and animal-friendly student population. With the support of The Humane League, the rapidly growing nonprofit that advocates for reducing cruelty to farm animals through public education and campaigns, Philadelphia public schools join dozens of other school districts across the country participating in similar programs. In October 2013, the City of Philadelphia passed a resolution supporting the global “Meatless Monday” initiative, which began in the U.S. in 2003, but is now active in 34 countries. This year’s Lean and Green Days are part of the city’s implementation of that resolution. The flashy colors of butterflies are matched only by their names: red admirals, great spangled fritillaries, tiger swallowtails, painted ladies and summer azures. On July 10, 13 volunteers at the North American Butterfly Association (NABA)’s annual Fourth of July butterfly count spotted all these species in all their regalia. The volunteers, who identified 18 other species too, visited six sites in a 15-mile radius around Bryn Mawr, Pa., to document all the butterflies they could find. More than 400 teams (including one at the John Heinz National Wildlife Refuge) participated in NABA’s three seasonal counts to provide snapshots of butterfly populations. Volunteers included butterfly enthusiasts and parents looking to connect their kids to nature. Butterfly volunteer Jan Clark-Levenson says that walking through fields and forests to see what flutters by is “a child-friendly sort of thing.” Claire Morgan, community garden and volunteer coordinator for the Schuylkill Center for Environmental Education—one of the stops for the Bryn Mawr team—says the butterfly census is an opportunity to engage non-scientists in important research. It is also a chance to promote butterfly-friendly practices. But if Philadelphians want to help, “the biggest thing they can do is plant native plants,” Morgan says. Natives not only offer flowers to adult butterflies but serve as hosts for their caterpillars. Although I enjoy soups, stews, root vegetables and roasts as much as the next locavore, I try to postpone that kind of cold-weather cooking for as long as possible. 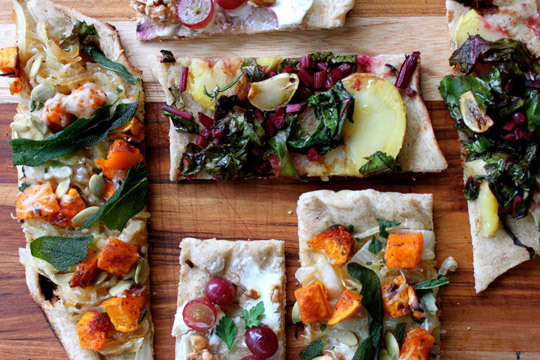 These flatbreads are my compromise: a nod toward autumnal flavors cooked on a grill for one last warm weather hurrah. The flatbread recipe yields six portions, enough for two each of the following flavors, one of which is vegan. Paired with a salad and something sweet, the full recipe will easily feed six. If the evening gets a little too chilly, throw your flatbreads back onto a warm grill to crisp up just before serving. Since volunteering in 2009 at Bartram’s as a community ambassador, Armstrong has inspired many to become members of the 45-acre urban oasis and former home to one of America’s first botanists, John Bartram. Considering a green career? You might research the field by hiking it. In 1978, I crossed the U.S. entirely on foot through forests and desert, along a maze of quiet dirt and gravel roads, by day and at night, in rain, hail and blasting sunshine. Measuring America with my body, I found it grander than any book, movie, statistic or voyage by car, train, plane or bicycle could reveal. 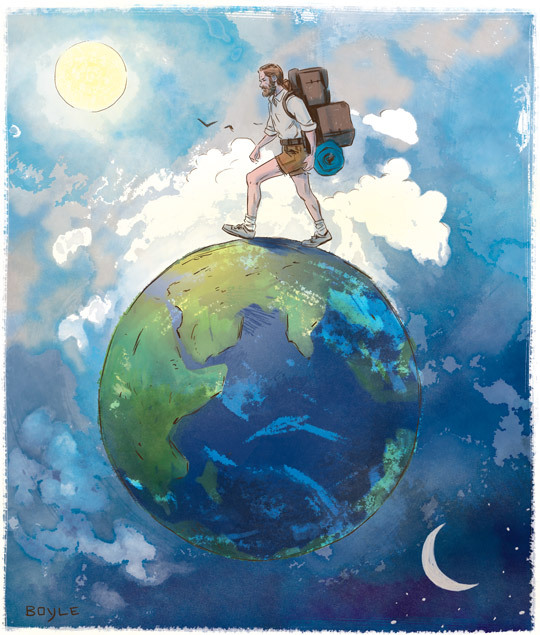 Illustration by James BoyleIntending to reinvent myself as an urban ecologist, I began walking from my home in Boston toward the Pacific Ocean via San Diego. After 199 days and 3,500 miles, I covered a distance greater than the diameter of the moon, or halfway to the center of the earth. Where did it get me? To new places, exposed to people, animals and storms. To novel encounters daily. Through forests, fields, deserts, mountains and rivers. Having started with $20 and a slim backpack, I worked odd jobs to buy supplies: picked apples in a migrant camp, taught half a day of school, hauled lumber, mopped floors, joined a carnival and built a donkey shed. I discovered that the whole world is a bed, finding shelter in apple orchards, barns, pastures, sheds, log cabins, wagons, abandoned homes, haystacks, churches, greenhouses, trailers, picnic tables, porches, gazebos, parks, stables, grandstands, sand dunes and yards. And I rediscovered that people are generous. I appeared from the woods at their doors, shared meals, attended parties, reunions and ice cream socials, and learned much of enduring worth. Despite the illegality of backyard chickens, ownership is apparently on the rise. 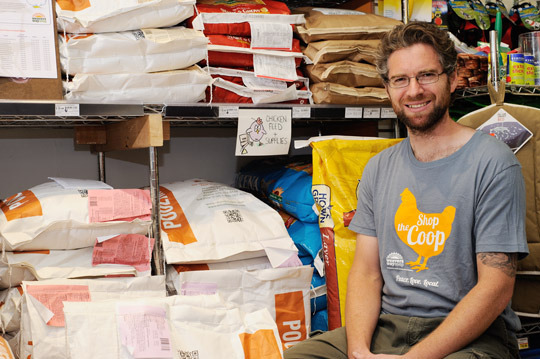 Anton Goldschneider, who manages the pet supply section at Weavers Way Co-op in Mt. Airy, says he’s noticed a significant uptick in chicken feed sales. Tom Martella, Vincent Cuinn and Apollo Heidelmark take care of seven hens in East Germantown. Maureen Breen's chickens wander about her yard on a warm September day. since 2004. It's time for that to change. Bailey Hale and his (now) husband Thomas McCurdy, a pastry chef, were happily tending to their flock of hens and chicks in South Philadelphia, an area they had lived in for 10 years. They owned their house and the lot next door where they kept a large garden, chickens and bees. “We could almost see City Hall from the bedroom, we were that close to downtown,” Hale says. “We were doing fine with it for quite a while.” But then, in 2011, a knock came at the door. Hale isn’t sure whether the inquiry began with the City or if a disgruntled neighbor alerted the authorities, but he never received any further notification or even a fine. They were subsequently left alone, but Hale and McCurdy were spooked enough by the incident and the threat of further action that they no longer felt comfortable in Philadelphia.